When you begin cleaning, of course you’ll remember to clean the kitchen counter and scrub the shower, but did you remember to clean the trash can? We get so caught up with cleaning all the basics, we don’t take the time to remember about the little things. 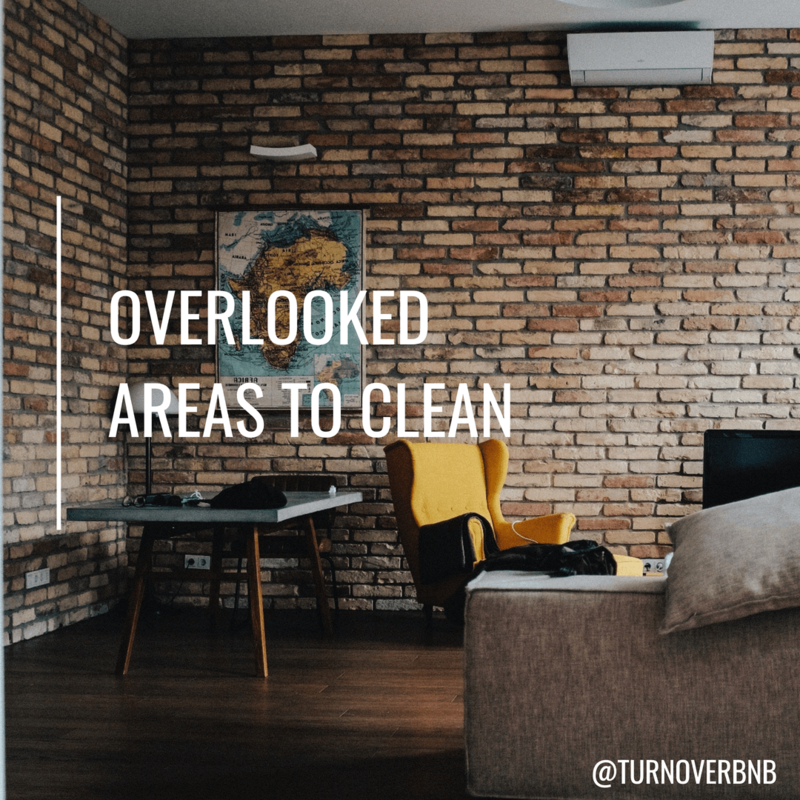 Whether you’re cleaning your vacation rental yourself or using an Airbnb cleaner, be sure you provide a thorough cleaning. Here are some of the most common areas of a home that overlooked when cleaning. Out sight, out of mind is the reason why we may forget to clean places that are out of reach. These places are often overlooked. Be sure to remember to clean on the top of things such as large appliances, bookshelves, and especially ceiling fans. Ceiling fans that are left uncleaned will spread dust all around the room with each use. It only takes about a month for a ceiling fan to be coated in dust. There are numerous knobs, handles, and switches that are used on a daily basis. This ranges from light switches to interior and exterior door knobs to the refrigerator door handle. Because these are touched on a regular basis, be sure to disinfect them regularly. Who ever would’ve thought that you would need to clean your trash cans? I mean, they are meant for throwing away garbage. Just because you take out the trash bag every time does not mean that you are getting rid of all the germs and odors that were in it. Odors and bacteria can linger long after you take out the trash. Wash your trash can out with soap and water and leave it upside down to dry before the next use. You probably remember to cleaning inside your shower, but do you remember to clean the shower curtain? Shower curtains are likely to be carrying bacteria and mildew. Who would want to be next to a filthy shower curtain in a place that you’re suppose to feel clean in. Most shower curtains can be thrown in the wash as long as it is on the delicate cycle. If your shower curtain is not washing machine approved, go the old fashion way and scrub it down with soap and water. So when was the last time you had these places cleaned? If you missed any of these areas in your last cleaning, be sure to add them to your vacation rental cleaning checklist. Although these areas of the house are important, do not lose focus on the other areas that need cleaning too.